Claude was a large elephant. Finlay was a small one. Claude is so large that he can make the earth shake with his trumpets, shower a whole herd of elephants, and stomp like thunder. Finlay is little and can’t do any of those things. He can’t wait to be as a big as Claude. But when they become separated Finlay has a special adventure all of his own. When they are reunited, Claude tells Finlay that one day he will be big, too. But in the meantime there is no hurry to grow up. 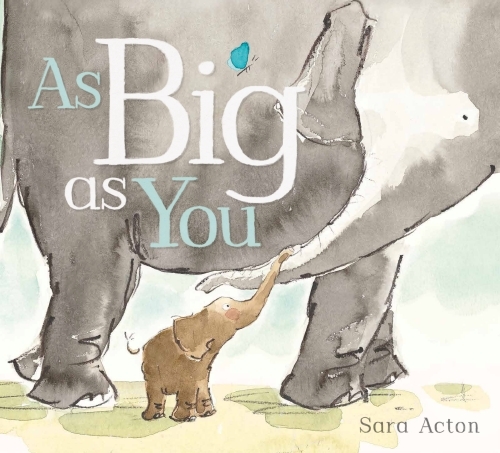 As Big as You is a breathtaking book. The story is really heart warming and the message is a good one, but it is the visual feast offered by the illustrations and design of the book which make it really magic. With the spine at the top rather than the side, each spread is long (portrait rather than the usual landscape orientation), which enables Claude’s size and the vastness of the landscape to be emphasised. On the opening spread, Claude is so big that very little of him fits onto the spread – one leg, one ear, one eye and a trunk frame the page, with the void in the middle bearing the single sentence ‘Claude was a LARGE elephant.’ The next spread introduces Final, and has him at the bottom of the spread, eye to eye with two beetles, and the spread above him largely empty apart from three butterflies. The cleverness of this beginning is carried through the book with simple yet beautiful watercolour illustrations and attention to text layout. Poppy Cat is a copy cat. She follows me wherever I go. She does whatever I do. A small girl shares stories of life with her loved cat, Poppy Cat. Poppy Cat follows her around and shares many of her daily activities. But each of them likes to do things by themselves too, with varying levels of success. Poppy Cat begins with early morning happiness and ends with bedtime happiness, shared with a pet. Illustrations are loose watercolours with black outline. Images sit in white space. Poppy Cat is a gentle story of a child and her pet, the two of them learning and sharing throughout an ordinary day. The mischief Poppy Cat gets to is seen as humourous rather than troublesome and there appears to be an understanding that everyone needs time on their own. The white space in which the simple text and images are set allows the reader to make this story their own. It’s a slow-down-and-live-in-the-moment story, revelling in the simplicity of everyday. Recommended for pre- and early schoolers.